Listings are the single most important piece of the Local SEO puzzle. A single mistake could cost you countless lost customers each year. As we learned from the Local SEO Lo-Down, listings have the unique advantage of appearing before other results in Google’s search. We all know making it to the coveted first page is the key to online success. According to HubSpot, “75% of people never scroll past the first page of search engines.” In addition, the “near me” search trend has continued to grow, doubling from 2016 to 2017, without any sign of slowing down as seen by the following Google Trends Time Line. Listings are the small bite sized bits of information given to searchers on different platforms such as Google, Bing Places, Yelp, and Yellow Pages. They include all the most vital information about a business. Think of listings as a digital phone book that can pop into search results. Google local listings are especially important because they appear on the map at top of Google’s first page results. Keep in mind when it comes to listings, the more information you have, the better. Name, address, and phone number (NAP) are absolutely essential; but reviews, pictures, hours of operation, and a quick, quality snippet about your business will all guide customers further down the conversion funnel. Creating a listing is just the first step. Many think the process is over once the listing is established. Unfortunately, merely making a listing isn’t enough to get your listing seen. Google won’t simply show the closest 3 locations in the “ 3-pack” of local listings. They like to ensure these listings are the best match for searchers, which makes ranking more complicated than you would originally think. Google tells us how to rank highest: be relevant, be prominent, be local. Relevance is matching your customers’ needs and wants. This is where the importance of keywords comes in. Both your landing page and your listing need to specifically speak to your customers. Tell them exactly what it is you’re offering. If you’re a pizza place and you never use the word “pizza” on your website (perhaps you reference your products as “pies” instead), you probably won’t be ranking highly when customers search for “pizza near me.” Keep in mind what your ideal customers will be typing into search. In addition to keywords, a healthy Google My Business description and appropriate category tags will help lead customers to you while also boosting your ranking. As a pizza restaurant, you may be tempted to use the broad category tag: “Restaurant” but when it comes to categories, the more specific the better. “Pizza Restaurant” would be the better choice to lead hungry pizza cravers to your location. One or two strong, precise categories are better than a handful of inaccurate, broad categories. Prominence refers to your digital presence. Google believes that the better a business is offline, the larger its online presence will be. Think of prominence as your popularity factor. Google checks your popularity around the web by inspecting other websites and directories (think Yelp and Local News sites). This is why inbound links and citations are important. Even offline engagement with your local community can boost your ranks. An article or press release that mentions your business without a link, is still thought to positively impact your search ranking. Volunteering and contributing to your local community will help your reputation both on, and offline. Customer reviews and social media presence also impact prominence. Reviews are not only a good signal to your customers regarding quality, they are also a ranking factor for Google. It’s good practice to respond to reviews, both positive and negative. It shows customers you care. Keep in mind, too many reviews at once will harm you rather than help you when it comes to Google’s algorithm. A consistent, steady stream of reviews is best. For social media, you may instinctively turn to Facebook but don’t forget about our friend G+. Google Plus reviews will appear as a part of your listing so it’s a good idea to consider maintaining the account for your business. Local listings rely on an ecosystem of websites to determine which results best meet searchers needs. This is why creating a Google My Business listing isn’t enough. Moz Local has a wonderfully complicated yet illustrative image to help show you exactly what we mean. Last and far from least is your location; more specifically, your proximity to the searcher. 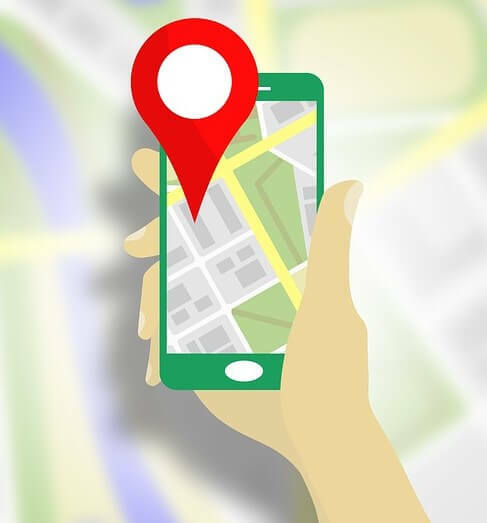 Even with GPS turned off, “Google will calculate distance based on what’s known about your location.” Keep in mind that other relevant, prominent competitors may also be close by. Are they out ranking you? Try searching for the services you offer to learn what other businesses in your industry are doing. It’s a good idea to include a link to your listing address directly on your website. Search Engine Land recommends linking to a map directly in the footer of your website pointing to your Google My Business listing. This will help to bridge the gap between your website and your listing. Ensure name address and phone are consistent across your website, listings, and citations. Optimize the keywords you’d like to rank for. Use specific category tags and informational business descriptions. Stay active online: maintain social media, react to reviews, and engage with local customers. Add a map linked to your Google location on your website. Keep an eye on competitors in your industry. Make sure your website is mobile friendly for on the go local searchers. Remember building any digital presence takes time and dedication to results. Working with Paragon will ensure your listings are working both for you and your customers. Want to know more? Check out Paragon’s Search Engine Optimization services. As a Digital Marketing Specialist at Paragon, Myra enjoys helping clients achieve their full digital potential. Her specialties include email automation and search engine optimization. Myra helps to streamline and quantify processes at Paragon by developing operating procedures, templates, and guides for all employees.